Local Ringing School of Art and Design alumnae to show career-spanning work during February event. Anticipating the return of the circus early in March, eight Columbia artists who honed their creative skills at the Ringling School of Art and Design are mounting a group show of career-spanning work. The Greatest (Art) Show on Earth will go on view Valentine’s Day in the gallery at Vista Studios, 808 Lady Street. The artists’ reception will follow on Friday, February 15, 2013 from 5 – 9 p.m. According to host artist Jeff Donovan, the only one of the eight who creates at Vista Studios, “This is a first! We have never shown together. Although some of our student time at Ringling overlaped, we were not all there at the same time. In fact, some of us had never met each other until we began planning this show.” Donovan, noted regionally for his paintings and sculptures, is also an art restorer with ReNewall. The variance of styles and techniques as well as diversity of work for this show evidences that the Sarasota, Florida-based art school does not produce cookie-cutter artists. Roy Paschal served as a forensic artist with South Carolina Law Enforcement agency before early retirement freed him to paint full time. Sally Plaxco Wallace drew and painted animals for Riverbanks Zoo for many years; she now specializes in equine paintings. Trahern Cook recently released his first children’s book for which he was both author and illustrator. Dennis Craighead is proprietor of his own design studio, and Hannah Tvedten, whose first post-graduation job involved painting mascot heads and masks for the circus wardrobe department, teaches art at Red Bank Elementary School. Dan Greshel, an independent art projects contractor and a recent past president of About Face, a live model-painting group affiliated with Columbia Museum of Art, creates assemblages from found objects. The illustrations and fine art paintings of Randall McKissick have taken their places in publications and on posters, in galleries and museum from Paris to South Africa, Hawaii to Chicago and New York, as well as Charleston and Atlanta. The show and artists are featured in the January-February issue of Columbia Living Magazine. 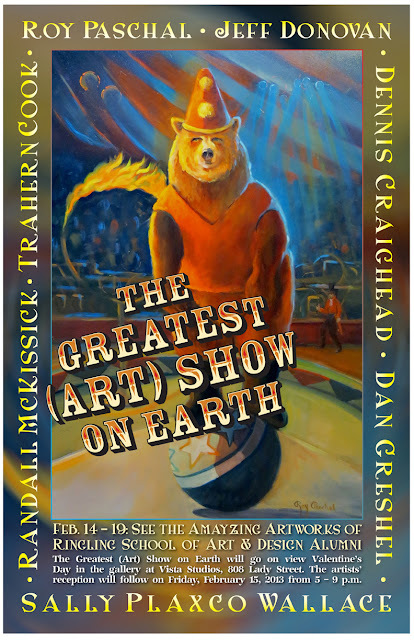 The Greatest (Art) Show on Earth will remain on view through 5 p.m. Tuesday, February 19. For additional information and images, contact Rachel Haynie 415-810-5380 or Jeff Donovan 803-760-4371.